Finance Minister Pranab Mukherjee started his Budget 2011-12 speech by saying, “At times the biggest reforms are not the ones that make headlines but the ones concerned with the details of governance, which affect the everyday life of aam aadmi”. Certain events in the past few months may have created an impression of drift in governance and a gap in public accountability ... such an impression is misplaced. Twenty years ago, the Central Government’s share in the total investment made in the country used to be 80 per cent. It has come down to just 18 per cent, indicating the dominating role being played by the private sector, pointed out analysts on the Budget day. Finance Minister Pranab Mukherjee has raised the Income tax exemption limit marginally for individual tax payers, reduced the surcharge on corporate tax and raised the minimum alternate tax (MAT) on corporates. The proposals on direct taxes will result in a net revenue loss of Rs 11,500 crore. 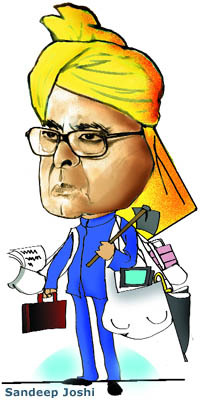 While Prime Minister Manmohan Singh praised Finance Minister Pranab Mukherjee for meeting all the challenges of the economy in the Budget, the Opposition was at a loss to criticise the spending announced in the social sector. The government today announced 20 per cent increase in the Budget allocation for the health sector. 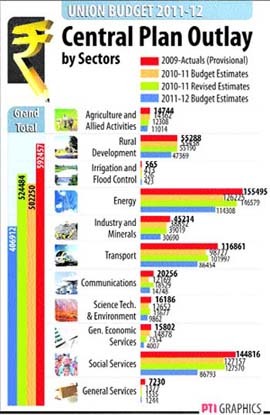 The allocation for the fiscal year 2011-12 would be Rs 26,760 crore as against the current year allocation of Rs 22, 300 crore. Finance Minister Pranab Mukherjee today did not hike excise duties as was feared and retained the rate of standard Excise duty at 10 per cent in the Budget. However, he has brought 130 items under the tax net by withdrawing exemptions granted earlier, though the burden would only be of the order of 1 per cent. Most of these relate to the consumer goods sector. The Budget has more than doubled the allocation for the judiciary at Rs 1,432 crore, with much of the hike going for augmenting infrastructural facilities and computerisation of district and subordinate courts. The allocation was Rs 687.19 crore in the Budget last year. The actual collection of service tax does not reflect the full potential of this sector. While retaining the standard rate of service tax at 10 per cent, the finance minister seeks to achieve a closer fit between the present service tax regime and its GST successor by bringing in a few new services into the tax net to expand the tax base while ensuring that the impact is predominantly on sections of society that have the ability to pay. The government today promised to resolve vexed environmental issues in a time-bound manner and provided for the Environment Ministry a minor increase in the Budget, taking the allocation up to Rs 2,491.97 crore from Rs 2,385.52 crore in the financial year 2010-11. The Finance Minister on Monday said his Budget proposals address the problem of high inflation and give a push to economic reforms. Defence spending has been allocated an additional Rs 17,071 crore for 2011-12 — some 11.59 per cent over this year’s Rs 1,47,344 crore defence budget. New Delhi will spend Rs 1,64,415 crore — nearly $ 36 billion - on defence which is about 13 per cent of the entire country’s budgetary outlay for the next financial year staring April 1. Around Rs 69,199 croree, it was Rs 60,000 last year — has been earmarked for capital expenses like for new acquisitions of weapons, planes, ships, equipment, naval dock yards and special classified projects. Union Human Resource Development Ministry’s ambitious reform agenda is unlikely to benefit from the allocation today’s Union Budget has made for the education sector. To set the tone for a newer, vibrant and more efficient economy, the government is taking major steps in simplifying and placing the administrative procedures concerning taxation, trade and tariffs and social transfers on electronic interface, free of discretion and bureaucratic delays. All government expenditure has to be oriented towards the production of public goods and services. Experience has shown that statutory fiscal consolidation targets have a positive effect on macroeconomic management of the economy. The hike in budgetary allocation to agriculture sector in the Budget this year has been hailed by the agriculture economists. Coming in the backdrop of emerging global food crisis and high inflation figures at home, Budget 2011-12 is Finance Minister Pranab Mukherjee’s attempt to revitalise India’s struggling farm sector, calm food prices and lay the foundation for UPA’s ambitious National Food Security Bill, which he promised to introduce in Parliament this year. Rural women and Anganwari workers and helpers who are steering India’s major health and nutrition programmes walked away with a lion’s share in the Union Budget 2011-2012. Investors cheered Pranab Mukherji's Budget proposals taking the Sensex up 595.62 points to 18,296.53 before skepticism about the government keeping its word caused the markets to close lower at 17,832 points or a mere 123 points gain. In the broader markets, the Nifty closed 29 points higher at 5,333 points. India's health allocation has been hiked by 20 percent with Finance Minister Pranab Mukherjee Monday announcing Rs.26,760 crore for the sector with special focus on research, insurance cover for marginal workers and medical education. There is not much cheer for the aviation sector in the Budget. Domestic and international air travel is set to get costlier from April, giving the aviation industry reeling under global economic slowdown another setback. Adding to the gloom is the fact that the industry’s long-standing demand to include Aviation Turbine Fuel (ATF) in the list of declared goods has again gone unfulfilled.